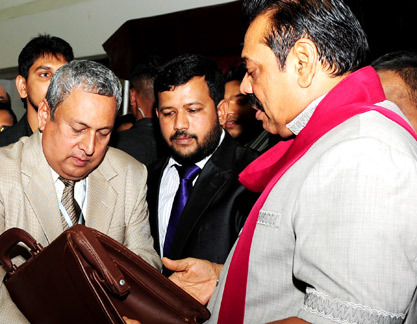 The sixth International Footwear and Leather Fair which opened in Colombo on Thursday concludes today. On display are footwear, raw material, travel goods, chemicals, leather goods, components and accessories and machinery. In addition to the public, importers, buying houses, traders, designers, wholesalers and agents, brand owners, and industrialists were expected to grace the expo. The exposition has events such as designer award ceremony, fashion show and stall competition. The Footwear and Leather Fair 2014 will strengthen and sustain the image of the industry among international buyers and provide an opportunity for SMEs to advance their talent and capability to become industry experts in the export field." According to EDB sources, Sri Lanka produces up to 15 million pairs annually, excluding rubber thongs which alone is estimated to be between 27 and 30 million pairs annually. The footwear industry which employs about 20,000 people directly and indirectly, includes 10 large export companies, 30 medium scale companies and about 3,000 small scale manufacturers. The footwear sector which showed growth from 2004 to 2007, was badly affected by global recession in 2008 and 2009. The value of exports of footwear and leather and leather products accounts for US $ 12.24 million and US$ 18.95 million in 2012 and US$ 29.27 million and US$ 21.61 million in 2013 shows an increase of export of footwear and leather products compared to 2012. The footwear sector grew 139.13% in 2013. According to the EDB, the footwear industry has significant potential to be a key contributor to the economy, and provides high end products to Mark and Spencer, Bata France, H.H. Browns, Clarks, Aerosoles and Nike. A diverse range of shoes including canvas and rubber boots, thongs, sports shoes and leather shoes are produced, using a variety of raw materials. The Sri Lanka footwear industry has already established itself as a quality conscious and fashionable supplier to well known international brands. "In a short space of time the shoe industry in Sri Lanka has adapted itself to the needs of the world market. Today it is equipped to tackle functional and fashion needs of the modern and ever changing market place," an EDB official said. The bulk of the production in the canvas range consists of upmarket fashion shoes in cold processed and vulcanised construction. Shoes are produced for well known brand names such as Esprit, Benetton. The rubber boot range consists of children's boots in attractive colours and designs, yachting boots, fishing boots, bean boots and boots for a variety of purposes including military, according to EDB sources. A large volume of rubber flip flops (thongs) are produced for the local and export markets. In recent times the leather shoe sector has emerged as one with good prospects. Today, leather shoes account for a significant proportion of the footwear exported from Sri Lanka. A variety of dress shoes, boots and casual shoes in stitched down and cemented construction are available for all genders. Sri Lanka is slowly carving out a niche for herself in the world market for leather footwear. Apart from manufacturing processed leather, the leather products industry includes the manufacture of goods such as gloves, wallets, bags and purses. There are approximately five large companies, 10 medium scale companies and around 1,000 small enterprises. Eleven tanneries in the country produce 25 tons of leather every day and most of the large companies have their own tanneries. Leather product manufacturers cater to famous international brands such as Play Boy, Laurel and Helen Kaminiski. One of the key advantages enjoyed by the footwear industry is the locally available high quality natural resources including rubber and sole crepe. Sri Lanka is the only country which produces and exports sole crepe with value addition. Encouraged by the push for 'green' products worldwide, there is a great demand in international markets for unit soles manufactured with Sri Lankan sole crepe. The major export markets for Sri Lanka footwear industry are Italy, UK and France and other European Union countries. The industry continues to consolidate these markets while aiming at entering emerging markets. Reliable quality, sustainable volumes and competitive pricing of our footwear have been key factors contributing to the success of the footwear industry in Sri Lanka.